1. We are the community shopper: Our content of Display & Classified ads has been an established medium of exchange between buyers and sellers in the Tri State areas of the Berkshires, Litchfield and Columbia counties since 1968. 2. We Direct Mail: We have a weekly certified direct mailed circulation of 15,000, plus we distribute up to an additional 3,500 additional copies free of charge at over 90 key traffic locations throughout the tri-state region. 3. We Add Value: No other print or online publication can offer you the sustained, targeted circulation, market coverage and readership loyalty of the Shopper’s Guide. 4. We Are Committed: Our 45,000 readers and advertisers support us and see us as an integral part of the local market economy. 5. We Get Results: Every week, residents, second homeowners, business owners, and visitors to the Berkshires look for and through the Shopper’s Guide to find out what’s for sale, where to go and what to do. It’s the publication where buying decisions get made. 6. We Are and Know Local: We have been bringing the Southern Berkshire community together and promoting the local economy for over 50 years! 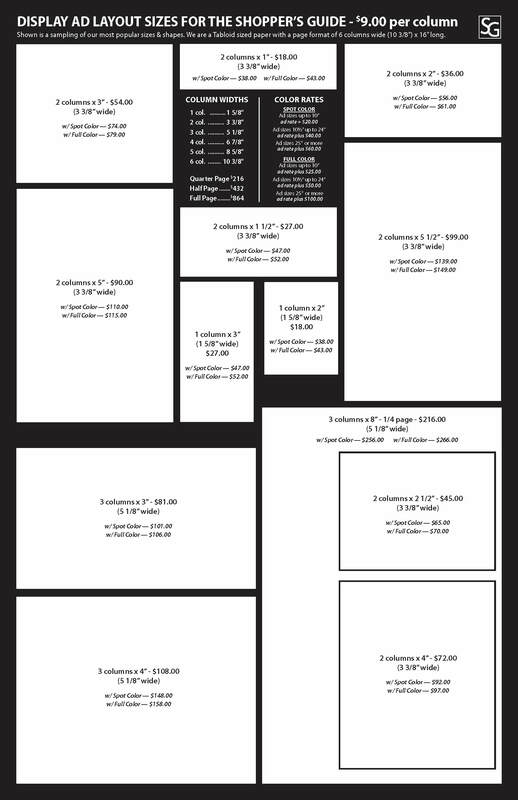 At $9.00 per column inch, we provide effective, affordable advertising for everyone! Download a Media Kit Now! For more information about advertising in the Shopper’s Guide, contact us.